...I couldn't think of anything confusing but the math. A. 1 = sin2(x) + cos2(x). B. tan(x) = sin(x)/ cos(x). 2. Purikura, small pictures on sticky film. If you've ever been to a mall where they have those photo booths-- the ones that print wallet-size or half that size pictures in minutes-- then you know the gist of purikura. Add to that a Photoshop-stamp-like feature that lets you put "stickers" and write on the photos, choose borders and basically scribble stuff, and you know purikura. Japanese secondary school kids, especially the girls, are obsessed with purikura. They take lots and lots of them and have entire photo albums full. . .like my classmate Rika. *Rolls eyes affectionately* anyways. How many pics you get to take home, how much it costs, and the size of those pics all vary. But, as Sakura-dear noted, it's a bit odd in Japan to take purikura on your own. Usually, one goes with friends-- and splits the cost-- to have fun and goof off. Japanese classes don't move. You stay in the same class all day except for the classes you "get" to pick, like Math. Naruto switches classrooms (and classmates, as you've probably noticed) then. But, for the most part, he stays in his classroom. Iruka is Naruto's homeroom teacher, if you haven't noticed. So it's Iruka's job to tell his homeroom about career tests and community service. And yes, my school did do those things. -__- I was bored, bored, bored to tears. Boys (from young kids to young men in their twenties) call a man who's older than them (but not quite old) "niisan" to show friendly-respect. If a 10-year-old called a teenager "Jiisan" they'd get mad. It generally implies that you're still young (and cool? Not sure) if you call someone "niisan" or "neesan" instead of "jiisan" or "baasan." 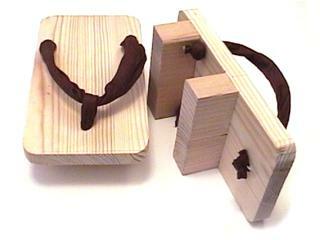 Geta are shoes. As Naruto noted, they were primarily used as rain shoes...so you don't get your feet wet when you walk in puddles. ...see Jiraiya's feet? They have red geta. 6. "—:—:—:—" and a switch to 1st person present (ex. "I am writing it" vs. 1st person past "I wrote it") signifies a flashback. That means that I've cut to a differnt scene, basically. Only the scene happens to have occured some time (years, in this case) before the present action. Usually this is done to give the reader some kind of insight to the character. 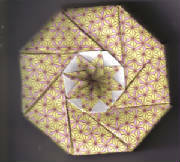 "Ori" comes from "oru" which means "to fold." And "gami" comes from "kami" which is "paper." Cool, huh? Anyways, it's basically the art of making stuff with paper!! My friends in CA make really cool omiyage that they can ship to you..."KawaiiNekoHat" is on the link page. Go look! My host mom taught me how to make these. It does take 16 pieces of paper, but less time if you know what you're doing. They're fun! I made about 40 of them with my host mom and our-neighbor-from-across-the-street's help. I made this in about half an hour. Please correct me if I'm wrong, ne? Referenced in the first chapter. It's a light-weight kimono-type garment that's less heavy, less expensive, easier to put on, and more practical. (Go to Footnotes Chpater 1 to see pics). Translated in the text. Basically, you say it when you get back home, and whoever was home before you welcomes you back. I suspect it’s also to make sure people know when you get home. Okaeri...the "o" is honorific. 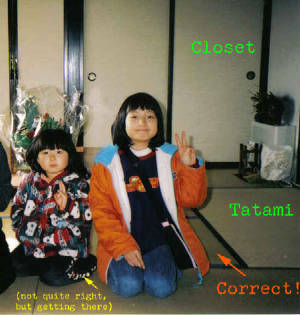 I suspect that "kaeri" comes from "kaeru" (to go home) and sometimes "nasai" is attached to make "okaerinasai." The "nasai" is basically formalities...maybe a "very"? Tadaima...is said only by the person waiting for you at home. ^^ I don't know the roots for this one. Enlighten me if you do? It's a greeting. It's rather informal and boy-ish. Simmilar to "osu" which is "hey," BTW. 14. Seiza, formal way to sit. Very formal, and it causes knee stress/strain on your joints when you're older (like Jiraiya). A "how to" seiza/kendo/something site (not mine).